The final release of Grand Auto Theft IV also includes music from Bob Marley and son, Damian Marley (a duet called â€œStand Up Jamrockâ€), as well as Munga Honourableâ€™s â€œNo Fraidâ€. 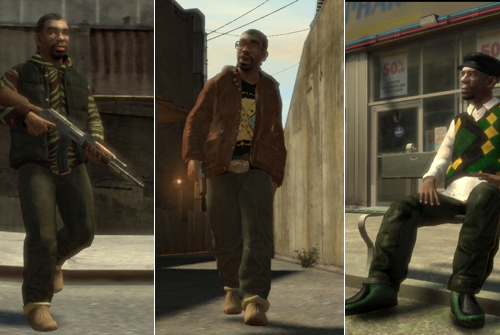 had the opportunity to style two characters in GTA4, Little Jacob and Real Badman â€“ Jamaican gangsters and gunrunners for the main character, Niko Bellic. Little Jacob can be seen wearing our Evil Heat hoodie, and keep an eye out for a vintage Rockers NYC â€œNo Surrenderâ€ tee in the GTA4 mission â€œJamaican Heatâ€. Check the picture above to see what a great job theyÂ´ve done.